Why is Costa Rica such a great place for writers? Since moving to Grecia in Costa Rica nearly 4 years ago, three of Aaron Aalborg’s novels have been published. His latest is ‘Terminated- The making of a serial killer, Volume 1’. It is a gripping tale of a poor boy rising from the slums to success in business and to combat in the Royal Marines during the 1982 Falklands war between Britain and Argentina. It is available from Amazon.com as both a paperback and e book. Several others are in the pipeline. Why is Costa Rica such a great place for Aaron and many other creative writers to work so productively? Aaron says there are three main reasons. They are peacefulness, support groups and connectivity. Lenny Karpman, who lives in La Guacima, is a well-known food writer. Costa Rica provided him with the material for his latest book, “Feasting and Foraging in the Central Valley”. It is the definitive restaurant guide for the area and is selling well. Dr. Lucinda Gray from California lives in Escazu. She is a practicing Psychologist and author of ‘New World Meditation’. 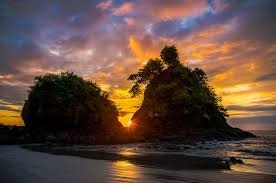 She considers Costa Rica to be an excellent place to practice mindfulness with all its attendant mental and other health benefits. Support groups are important to writers. K. Francis Ryan lives in El Cahon near Grecia. He is writing a four part series of novels about the paranormal, the latest one is ‘Echoes through the Vatican’ set in Rome. He tells, “There are several writers’ groups in Costa Rica. They cater to a variety of needs. “By meeting with fellow writers you receive constructive criticism on your writing and can share news and information on: style, publishing and the writer’s craft. Fellow writers have common issues and offer encouragement good fellowship and helpful ideas. “I attend a writer’s group with fellow novelists Mike Crump and Aaron Aalborg. It is organized by our publisher Penman House Publishing. If you are interested, you can read about our doings at: http://www.penmanhouse.com/ and give feedback. Dozens of published expat authors now live in Costa Rica. You can see why.